In the following review about Himalaya ProstaCare, we determine the effectiveness of the supplement based not only on its ingredients, but also by how much it costs and what other customer service the manufacturer offers. 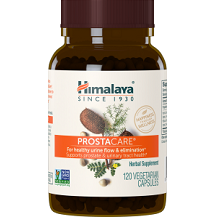 Himalaya ProstaCare is a natural supplement designed to support prostate health and reduce frequent bathroom trips. The ingredients in the supplement are said to contain compounds that help to strengthen the cells in the urinary canal. This helps to combat the effect that prostate enlargement has, which is pressing up against the bladder and urethra and obstructing proper urine flow. There is some evidence that the ingredients also support prostate health, but this is not conclusive. It appears that the manufacturer designed the supplement to simply restore urine flow and not necessarily to reverse the prostate enlargement. The ingredients they’ve included in this supplement are not classically seen in prostate support supplements, so their effectiveness is somewhat questionable. Most other prostate supplements include ingredients like saw palmetto extract, which has been scientifically proven to reduce the prostate cell multiplication that is responsible for the prostate enlargement. For some reason, unknown to us, the manufacturer has specifically tried to avoid the inclusion of saw palmetto extract in the supplement. Without the manufacturer giving a reason, we cannot see logically why they would want to do this. Two capsules of Himalaya ProstaCare must be taken twice daily with a meal. The manufacturer does not specify whether they should be taken together as one dose or as two separate doses. It’s difficult to determine the dosage of each specific product as the manufacturer lists it as one proprietary blend that is 590 mg. The manufacturer does not mention any specific side effects associated with the use of this product. Customers taking chronic medication should seek the guidance of a physician before using this supplement. There are two pricing options – a 1 month supply (60 capsules) for $27.95, and a 2 month supply (120 capsules) for $48.95. These prices don’t seem to include shipping or taxes and there are no bulk order discounts or subscription discounts, for either of the pricing options. We couldn’t find any evidence of a guarantee or returns policy for this product. In our experience, This is usually an indication that the product is not completely trustworthy, because the manufacturer is not completely sure of themselves. The price of Himalaya ProstaCare is really quite reasonable and we believe it beneficial that the manufacturer offers more than one pricing option. We do have some serious concerns with this product though. 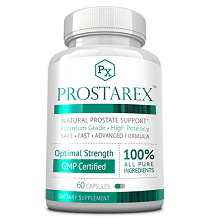 The major concern with this product is that the ingredients do not seem to be directed toward reducing prostate growth but rather simply to strengthening the urinary tract. They also don’t have as much scientific evidence to support them as the other ingredients classically included in prostate supplements. If customers buy this product and find that it doesn’t work, they will have wasted their money because the manufacturer doesn’t seem to offer a guarantee.